Basutoland was an independent native state in South Africa which was annexed to the Cape Colony in 1871. In 1881, control was transferred to the British Crown and a separate British Crown Colony was established in 1884. Following independence from the United Kingdom on October 4, 1966, Basutoland was renamed the Kingdom of Lesotho. It has a total land area of just over 12,700 square miles and a population of over two million. 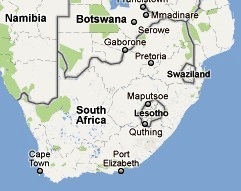 The area is surrounded by the Republic of South Africa. The area of Basutoland used stamps of Cape of Good Hope during the period from 1871 to 1910. From 1910 to 1933, it used stamps of the Union of South Africa. The first stamps of Basutoland were a set of ten stamps released on December 1, 1933 showing a crocodile and river scene along with a portrait of King George V (KGV) in different colors and denominations. The set (Scott #1 to #10) catalogs for around $245 MNH and around $345 Used. A very similar design with the KGV head portrait replaced with a KGVI portrait was used in a set of eleven stamps in 1938. That set (Scott #18 to #28) is more affordable at around $75 MNH and around $60 for Used. Common design types along with a several original designs in short sets formed the stamp issues of Basutoland during the period till 1966. Most of the sets are not that valuable cataloging well under $10 for MNH or Used. The Queen Elizabeth (QEII) local scenes set of October 18, 1954 is however valuable and sought after. The set (Scott #46 to #56) catalogs for around $75 MNH and around $55 Used. The designs show Qiloane Hill, Orange River, Mosotho Horseman, Basuto Household, Malet-sunyane falls, Herdboy with lesiba, Pastoral scene, Plane at Lancers Gap, Old Fort Leribe, Mission Cave House, and Shearing Angora Goats. Basutoland adopted a new currency (100 Cents = 1 Rand) in 1961. A few surcharge overprints along with varieties of some earlier sets using the new currency appeared during the period from 1961 to 1963. The issues have valuations in a similar range to that of the original issues. Stamps of Lesotho replaced stamp issues of Basutoland in 1966.